The idea of supporting prisoners’ rehabilitation and make the Nigerian Prisons Service self sufficient has received a boost as a rice farm (Lakushi Farm Centre) operated by prisoners in Plateau State has yielded 400 bags of rice in the year. Lakushi which is one of the 17 Farms owned by the Nigerian Prisons Service is operated to enhance modern skills/training in farming techniques so as to enable the inmates learn while in detention and put the knowledge gained when they regain their freedom. 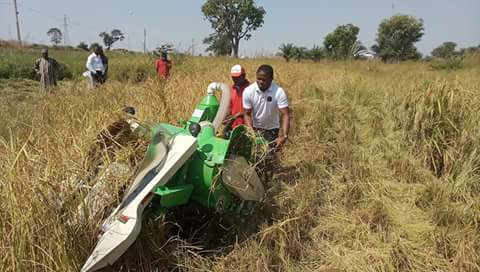 According to a statement issued yesterday in Jos and signed by the State Command’s Public Relations Officer, ASP Luka Ayedoo, the success came because the farm was re-positioned with funding to ensure the procurement and distribution of modern farm tools and inputs. The statement reads,”The Lakushi Farm Centre of the Nigerian Prisons Service has harvested over 400 bags of rice in 2017. The farm is one of the 17 Prisons farms in Nigeria and major in rice production because of it comparative advantage. The farm was repositioned to diversify the Nigerian economy with emphasis on the agricultural and mining sectors. “The farm is already living up to it expectation of supporting prisoners’ rehabilitation and reintegration through enhanced modern skills/training in farming techniques; and have kick-started the Nigerian Prisons’ drive towards self-sufficiency. It added that, “The Lakushi Farm Centre in 2017 received two tractors, one operational vehicle, two boom sprayer, three seed-drill planter, two multi-crop threshers, herbicides, pesticides etc. The Controller General of Prisons, Ja’afaru Ahmed also approved the sum of N33, 44,291.58 for the renovation of the farm building and inmate cells; which is ongoing.” Ogbeh Calls For Caution, Calm Over NIFOR Leadership.